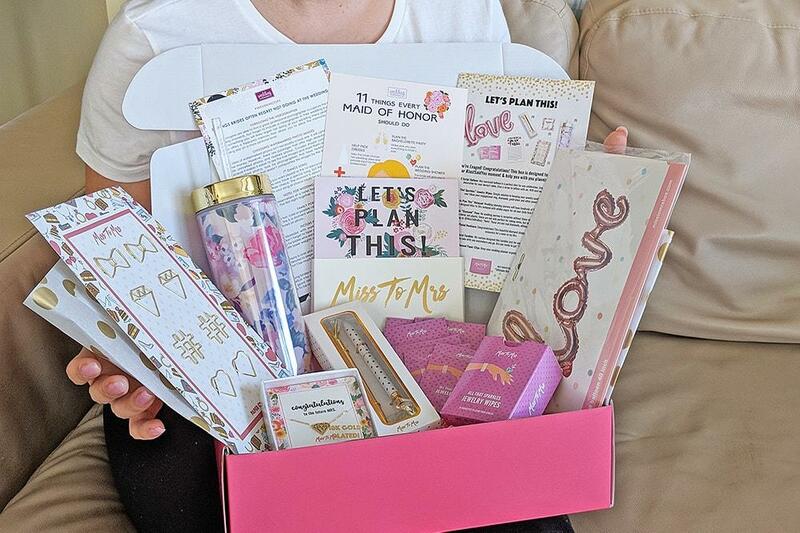 Wedding Forward first reviewed Miss To Mrs Bridal Subscription Box back in January. Since then Miss To Mrs kept improving their boxes and we are excited to share with you the latest update! Read below what makes this box so special and find out details behind each item we received in our box. Are you recently engaged? 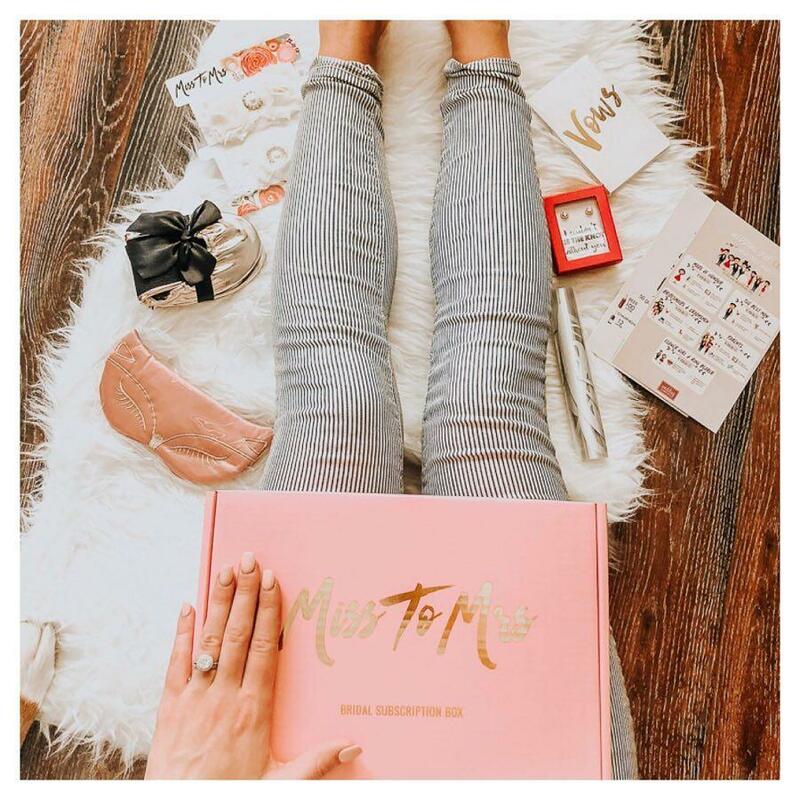 Miss To Mrs created a subscription box specifically for brides-to-be! It is tailored to match a bride’s wedding planning journey, to receive monthly gifts to pamper yourself while helping you plan & prepare for the big day! 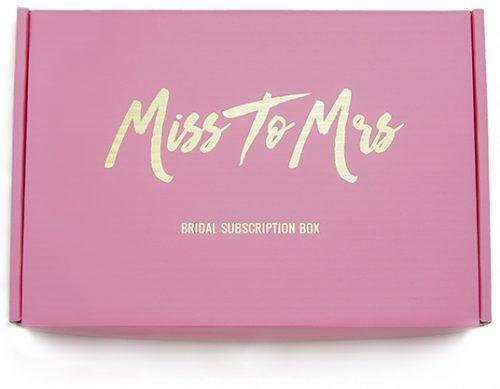 Unlike other bridal boxes that send same box to everyone each month regardless of when you subscribed, Miss To Mrs team has created 8 unique themed boxes tailored to the bride’s wedding planning journey. This ensures that all boxes remain super fun and are packed with useful items. 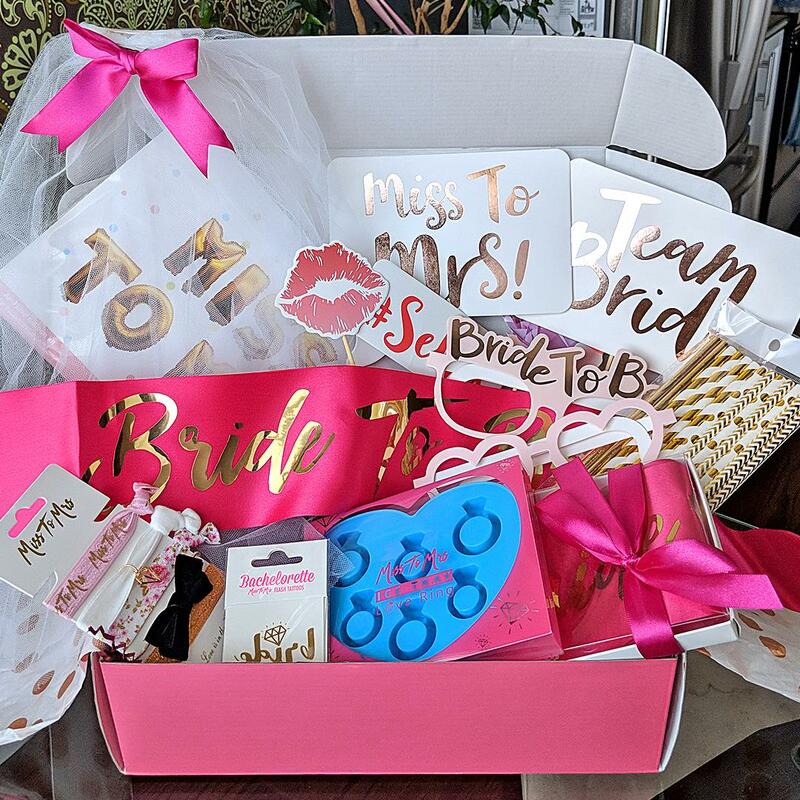 Even though themes stay the same, the items in each box will change over time as the Miss To Mrs team keep improving them to keep up with the latest trends and based on bride’s feedback! GIVE AS GIFT Subscribe Now! The image you see above is exactly what we got in our updated box. Love the box itself! This box definitely qualifies as a keepsake box. Gold foil stamp on the top looks just so glam. The box measures 12x8x3.5 inches making it pretty sizeable. LOVE script balloon would be perfect decor for your desert table at the bridal shower or bachelorette party, or just as photo prop at the wedding. Balloon was easy to inflate and did not require helium. Just use a straw, inflate, and the self-seal opening keeps the air in without any trouble. 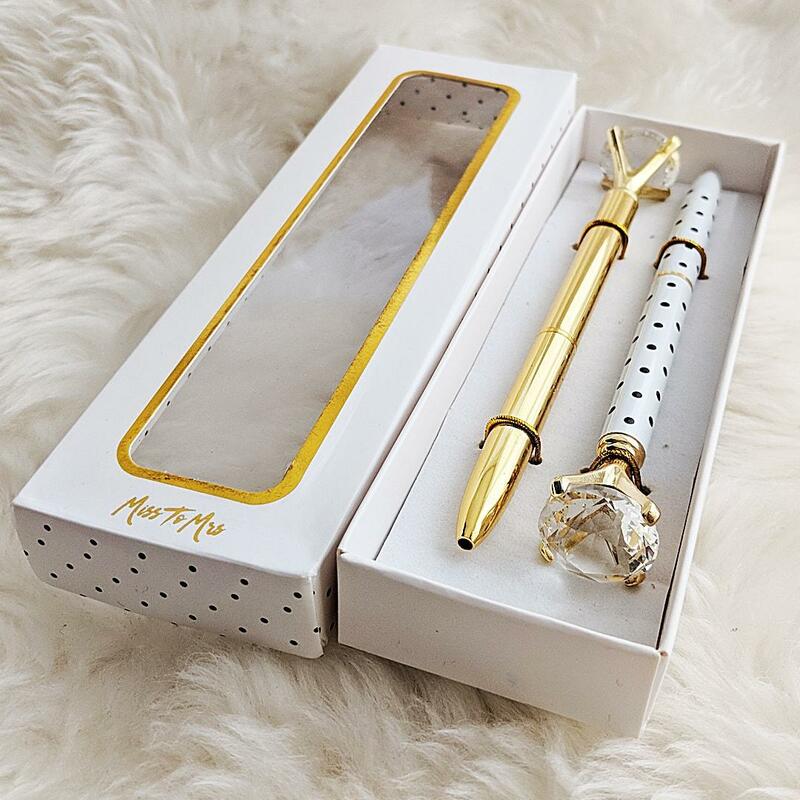 We got not 1 but 2 pens in a beautifully packaged box – gold and white with black polka dots. While we wish these were real diamonds, they are not, but the pens are must have for any bride. The quality of the pens is also superb. They are metal, not cheap plastic. Absolutely love this notepad idea! It’s got lines to write down your TO-DO’s and in addition, it’s pages are peel-and-stick! Genius!!! We use it all over our office now to write down and check off various tasks. This notepad is one of custom designed items by Miss To Mrs team and they tell us its part of upcoming bridal stationery collection…shhhh. When Miss To Mrs promise on that they include premium items, they mean it. This necklace is so cute! It’s not solid gold, but the necklace is 18K real gold plated. The chain is adjustable which is a nice touch. The updated necklace is nearly twice as big as the first version we reviewed. This tumbler is so darn pretty. Gold rim at the top and a beautiful floral design inside the double walled enclosure. 18oz size and BPA free, one of a kind since once again its designed by Miss To Mrs Team. OMG! If you like your engagement ring to spark all the time, these are such a smart idea. Miss To Mrs includes a set of 10 towelettes to clean your engagement ring. Individual packs are small enough to carry around with you for any-time clean. Keep your wedding ideas organized with this super cute set of paper clips. Perfect for your magazine clippings or to use in the wedding planner, or even on photos after the wedding! First card is “11 Things Your Maid Of Honour Should Do” – fun infographic to tell your MOH what they are responsible for. Second card is “8 Things Brides Often Regret Not Doing At Their Wedding”, one of the most popular posts on our blog and must read tips to help you make some critical decisions. Wow, 8 awesome items, the quality is definitely premium, no shortcuts here. We loved that there is a little bit of everything. Something fun, something cute & all very useful. 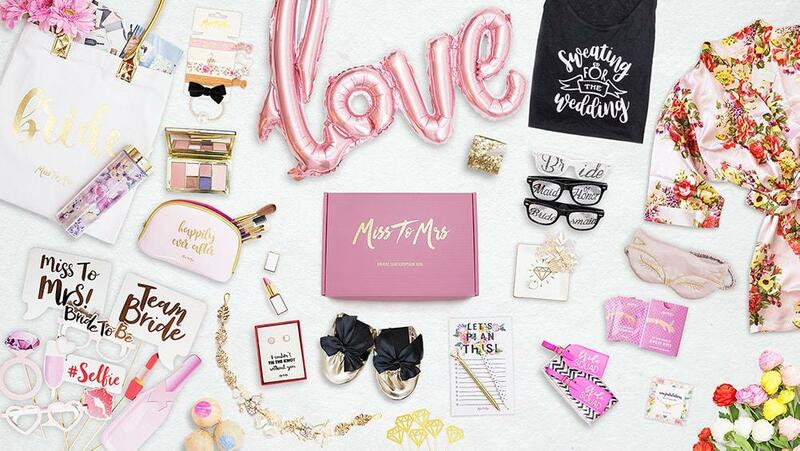 We definitely recommend Miss To Mrs Bridal Subscription Box!